I’VE CHASED AFTER RAINBOWS; I HAVE CAPTURED ONE OR TWO. I HAVE REACHED FOR THE STARS; AND I’VE EVEN HELD A FEW. I’VE WALKED THAT LONESOME VALLEY, TOPPED THE MOUTAINS, SOARED THE SKY. These are the opening lyrics to a very special song of mine called “Try.” It’s always been the theme song for my Imagination Library because it really captures exactly why I started the program twenty years ago. I want children to have the opportunity to chase their dreams –no matter who they are or where they live. It is hard for me to believe that the Imagination Library is now 20 years old. I think of the program the same way I think of my songs –they are all like my children –each one special and all of them a source of great pride. The Imagination Library has done pretty well as it has grown from my hometown to a bunch of countries and touching 875,000 kids each and every month. This year we will give out our 75,000,000th book. Simply amazing! Like a good parent, I cannot take credit for my child’s success. All kinds of people and organizations have pitched in over the years to make it all so wonderfully successful. At the very top of that list of special partners sits Rotary International. Several years ago, I stood on a stage in Montreal and sang “Try” for the thousands of Rotarians at the 2010 RI Convention. It was a very moving moment for me because I knew we were joining forces with an organization that cares as deeply for children as I do. It’s been a wonderful marriage and I look forward to our organizations continuing to help our children foster a love for reading. We have done so much but there is so much left to do. THE FIRST STEP IS THE ONE THAT’S ALWAYS HARDEST. BUT NOTHING’S GONNA CHANGE IF YOU DON’T TRY. SO SPREAD YOUR WINGS AND LET THE MAGIC HAPPEN. YOU’LL NEVER REALLY KNOW UNLESS YOU TRY. 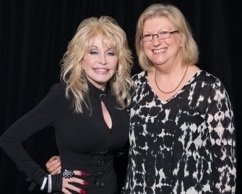 Rotary’s service partnership with The Dollywood Foundation’s Dolly Parton Imagination Library provides opportunities to collaborate in support of basic education by fostering a lifelong love of reading and learning from an early age. Through this partnership, children receive access to age-appropriate reading materials to help establish a strong educational foundation early in life. Gracias, Jeannette! Espero que esten muy bien.